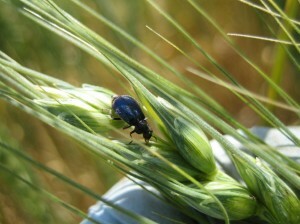 The adult beetles are soft-bodied and elongate-oval in shape, about 10 mm long or less. Many are bright in color with brown or red and black markings. Species Collops hirtellus is metallic blue or green in color and usually orange on the ventral side of the body. Also, the two basal antennal segments are greatly enlarged. Larvae are soil-dwelling, orange in color, up to 13 mm long with two hooks on their rear segment. C. quadrimaculatus (Fabricius) is another species from this genus very common in North America. Adults are reddish, with two bluish black spots on each forewing. Batrachotoxins are found in them. Triplehorn, C. and Johnson, N.: “Borror and DeLong’s Introduction to the Study of Insects, 7th Ed.”, page 429. Brooks/Cole, 2005.